Ancient Stones - Lothian - 037 Justice Stone, Hopetoun Wood, Queensferry. 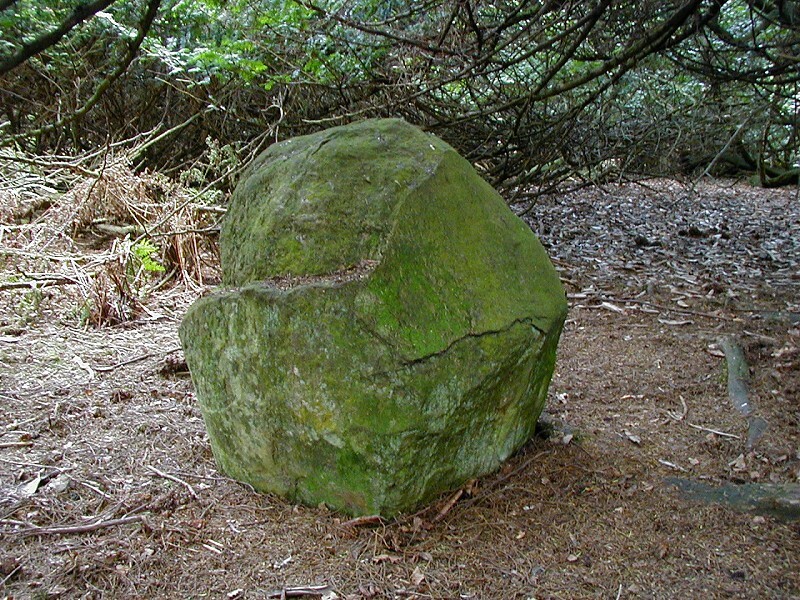 The Justice Stone is a large block of whinstone situated beside the track running through Hopetoun Wood. The stone is well hidden inside a clump of ewe trees and rhododendron bushes and can be easily missed from the road. The stone measures 0.90 x 0.90 x 0.75 high. Hopetoun Wood can be found off the A904 Queensferry to Bo'ness road. Enter the wood at the south end near the Garden Centre and follow the main track towards the north east. The stone is hidden in the first clump on the left. GPS receivers may not work correctly at this location due to the surrounding woodland. There is no parking in the area although the car park at a nearby garden centre may be used. Take care if walking along the road as traffic can be busy and fast. The stone is traditionally taken to be the place of meetings by Barons and Knights for the purpose of tournaments or jousts and was known in the past as the Jousting Stone. Disputes are said to have been settled by the Barons and Magistrates in early times at this stone. On my first visit to this location, armed only with a 1:50,000 O.S. map and the entry from CANMORE, I must have spent two hours searching the woods for this stone. Four foot high bracken, dense patches of stinging nettles and the constant fear that a gamekeeper was going to appear at any moment, all made for an interesting day out. The stone, or rather what I thought was the stone, was eventually found beside the track. I did have some doubts at the time but there did not seem to be anything else around. The stone is disappointing, being simply a rough, un-worked boulder, but I had set myself the task of recording all stones of interest even those as un-photogenic as this one. Then, in January 2002, Steve at Ancient Lothian drew may attention to the correct stone. My thanks to Steve for finding the correct stone and I also forgive him for taking such great delight in telling me so! 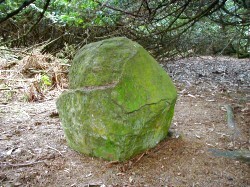 This stone was located easily on my second trip to Hopetoun Wood, following the directions supplied by my rival Steve. The stone itself is good and solid and well qualified for the part. It appears to have been worked in the past and also to have been damaged with part of the top missing. This might be deliberate as many so-called "pagan" stones were defaced by religious authorities to prevent them being used.